This website is presented by Partystar as an impartial information portal on the Melbourne lockout trial. A gloomy start to one's night or a necessary evil? The Joint, Elizabeth Street, 29/08/08. 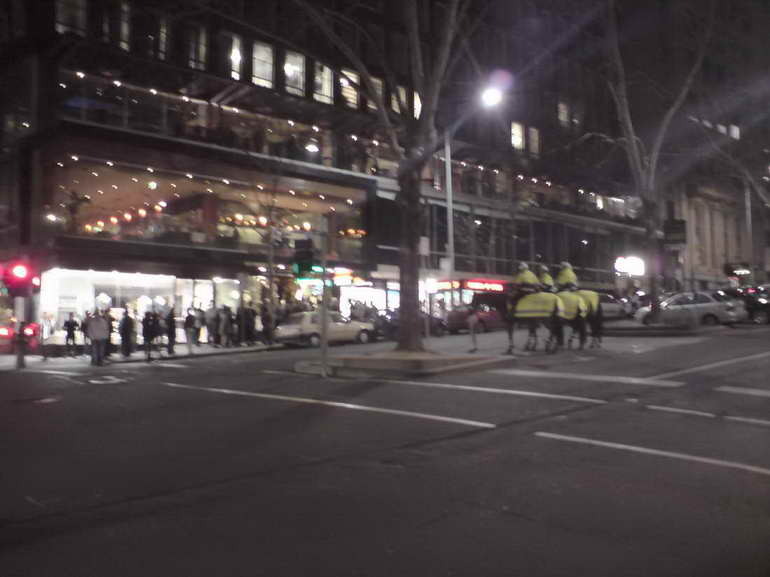 3 mounted police observing patrons queuing outside a city nightclub. How accurate were violent crime statistics when mounted police were in force during the trial period? CQ Nightclub, 11:40pm, 29/08/08. "Thousands of people visit the City of Melbourne every week for late night entertainment. The City's exciting range of restaurants, hotels, nightclubs, bars and adult entertainment venues makes it a vibrant, 24-hour destination for people of all ages." 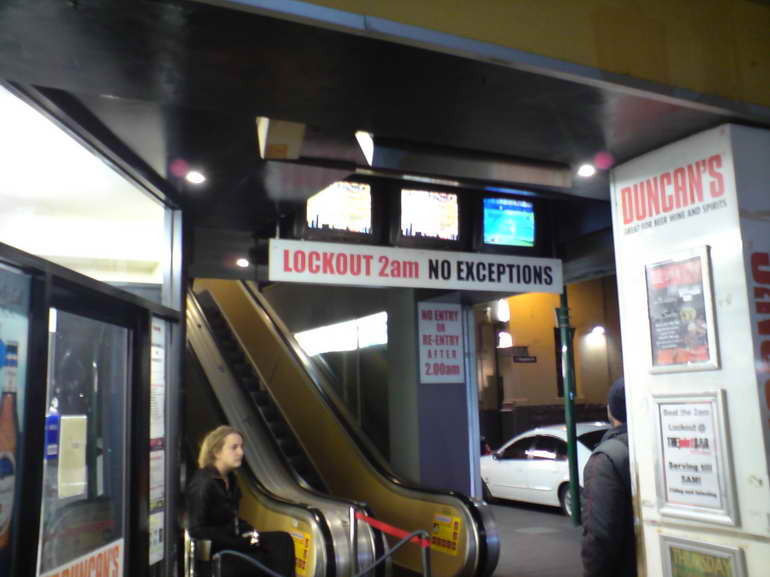 The lockout was a three-month trial of 2am late entry bans for pub, bar and nightclub venues. During the trial, licensees in the inner city council areas of Port Phillip, Stonnington, Melbourne including Docklands and Yarra councils could not allow patrons to enter their venues from 2am to 7am. Patrons who were already in a venue could remain until closing time but could not leave and re-enter the premises. Licensees who breached the lockout by allowing people into their venues after 2am faced fines of up to $6800. Figures in brackets indicate count of pub/bar/nightclub venues in that suburb. Included are suburbs with 10+ venues. Click on suburb to list venues. Figures taken from MelbournePubs.com 05/05/08. KPMG was commissioned by the government to survey both venues and patrons after the lockout trial ended. It was reported that the lockout had not worked effectively and that the State Government was not going to pursue the lockout plan. In fact, it was reported that violent crime was up during the lockout trial period. On 10/11/08 it was reported that a "time-out zone" would be introduced, along with 50 extra police on the streets during weekends, in an effort to combat booze-fuelled violence in the CBD. The renmants of the lockout were increased powers awarded to the director of Liquor Licensing to shut down targeted problem areas if need be, such as a street, area or venue, rather than a citywide or statewide lockout. Available on the Liberal Party of Victoria's website at http://www.vic.liberal.org.au/default.cfm?action=policies_2006 under the section "Justice & Law" can be found the document A LIBERAL GOVERNMENT PLAN FOR VICTORIA POLICE: OUR STREETS, OUR HOMES, OUR FORCE. A Liberal government will introduce entertainment area lock downs and venue lock outs across metropolitan Melbourne and country Victoria to reduce alcohol related crime and violence resulting from venue hopping. The exact timing of lockdowns / venue lockouts, currently 3.00am in trial areas, will become mandatory following consultation with all relevant stakeholders. Read the arguments raised. Then visit one of the many websites below. Webmasters & blog owners, please contact us with a digest of issues raised so that we can include them in this section. Restores the balance between Melbourne's vibrant nightlife and the increase in alcohol-related violence, anti-social behaviour and alcohol related health problems. Stops pub crawls that lead to violence. Reduces the amount of people 'venue hopping' late at night often after they have been kicked out of another venue. The majority of alcohol related violence occurs on the streets as people move from venue to venue not in the actual venues themselves. 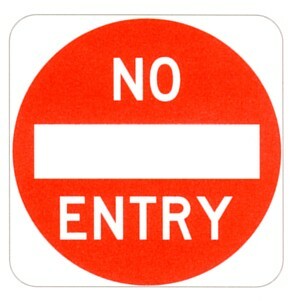 Late entry bans control the movement of people and allow police to target key times around 2am. This gives police a greater ability to manage people not in a venue late at night. The lock-out will last for five hours, giving police time to clear the streets and for drunks to sober up. The majority of law-abiding people punished by the actions of a small minority. Loss of freedom of choice. Having to choose one venue for the rest of your night. Spoils what makes Melbourne a wonderful city. Death of the entertainment scene and vibe in Melbourne. Hospitality staff unable to go out after work. Shift-workers unable to go out after work. Bands & DJs unable to travel to late gigs. Not being able to meet friends at other venues. Venues closing after 3am selectively choosing which patrons to let inside. Venues closing after 3am raising cover charges. 1am-2am spillover period with the streets full of people. Queues outside venues that stay open after 3am forming before 2am. Still standing in a queue when the clock hits 2am leads to a large group being stranded on the street. Having such a large group of people roaming the streets will only add more problems for an already stretched police force. Queues and tension hailing taxis at 2am for those left stranded, thus now unable to continue their night. Queues and tension hailing taxis at 3am for those leaving 3am-closing venues, thus now unable to continue their night. Small-capacity late-opening venues unable to replace ejected patrons, leading to a sparser crowd. Small-capacity late-opening venues unable to replace patrons going home, leading to a sparser crowd. Increased operational costs for venues, which will be passed on to the patron. Loss of revenue and business for venues. Door staff (cashiers, greeters etc) having their hours of work cut back at least 10 hours per week. 1am happy hours at post-3am venues to lure patrons away from other, earlier-closing venues. Vehicle travel to non-curfewed entertainment areas - increased risk of drink-drivers & road accidents. Thousands of revellers descending on e.g. Moonee Ponds after 2am. Devaluation in city apartment prices. Encourages illegal after-hours bars to operate. No readily-accessible statistics made available to the public on violence levels. Overwhelmingly these issues of late night violence, anti-social behaviour, are related to late night clubs and nightclubs. Pubs are concerned that they might be unreasonably targeted in some situations. England removed their 11pm closing times in 2005 to stop violence. Bendigo 2am curfew is financially hurting venues that must close by 3:00am. Note: We are not responsible for the content of external internet sites. The proposed 2 AM lock out is a reactionary, ill considered and dangerous social experiment. It punishes fun loving Melbournians and tourists into a seventies style lifestyles and it will make Responsible Serving of Alcohol very hard to monitor as punters will be locked into the one venue all night long. This lockout will fuel the already dangerous drug business and create an illegal venues market run by cashed up drug barons. It will mean more kids drinking in parks, private homes, on the street, where there are no Licensed Crowd Controllers to look after them. There will be gangs of youths walking the streets aimlessly, and drugs will be an easy, almost logical solutions for them. This will mark the end of Melbourne CBD as a 24 hour city, and hand to Sydney the opportunity to copy our formula. A very successful formula, that large cities go to great length to develop. What is the key ingredient of running an attractive tourist destination ? It is to maintain a strong, professional Police Force who is engaged at all times to protect the streets from exactly what has been happening in Melbourne. Or does or Premiere believe that there are enough Police walking the beat in Melbourne? Or does he believe that humans have progressed to a state of Homo Superior and we no longer need policing? Do our politicians and senior Police officers never travel ? Have they not been to Rome, Paris, London, Tokyo, New York, etc etc ? In Paris they have the Foreign Legion guarding the Eiffel Tower, in Rome there are Carabinieri, Guardia di Finanza, Polizia and Municipal Police all actively, constantly making their presence felt. But not Melbourne, here we leave the streets to be owned by any deranged, bottle shop bought stubbie carrying thug, to do as he pleases, knowing very well that he has an almost gauranteed chance of not getting in any trouble. Not by Police anyway. So who's fault is it. Its bars who have been so successful in turning a once derelict CBD into a world class tourist destination. We are guilty of success. The government and with it Melbourne City Council, is guilty of not protecting such a glorious success. Its like a bank getting continously robbed and the only answer the Police have is to limit the hours of trading of the bank, or closing it down. Yes, illogical. And seeing as we do not have any natural attractions like a lovely harbor, or a breathtaking bridge or a benevolent climate, one asks, why would tourists come to Melbourne ? Melbourne is that place where you get locked out of venues, isn't it. Maybe we should go to Brisbane instead, get some sun too. One last point is the gambling industry's protective blanket once again thrown by the government, to make sure the tax dollar keeps rolling into State's coffers. Blatant, wrong and realistically, completely undemocratic. Remember that Crown Casino is already exempt from smoking laws in some of its rooms. Rich gamblers seem to have more rights. Cover up, don't want you to get a chill. I believe that the 2am lockouts are very poor solution in response to the occurrence of violence and disruption caused by a minority of public. The authorities do not seem to have taken into consideration what work has gone into developing a sophisticated vibrant culture in Melbourne for socialising. Something that on the whole is of great benefit to the community at large and to the economy. And the envy of other cities. The infrastructure now required to support that culture is not *just* about regulating venue operators alone it is about providing more police present, dealing with the small percentage of offenders more thoroughly, more transport options, sobering up centres, more public toilet facilities. Marketing campaigns that promote better behavior of those patrons that for what ever reason misbehave. I believe that the 2am lock out will have an extremely negative effect on the Melbourne community and the viability of entertainment venues. Firstly, I think this move is draconian! and will never vote labour again! Secondly i believe that we are returning to the dark ages with our law making, no consultation and using methods that work in the country and Queensland, places Melbourne need not imitate! We have been selling Melbourne as a 24 hr city now for quite a while, if someone arrives(remembering tourism being one of our largest income streams) from Europe or the States and their plane gets in at 12am they will probably not make it out for a beer and would rightly head to Sydney where they have in fact relaxed their liquor laws to be more like Melbourne!! When my staff finish work they cannot go out for a social drink after a hard night at the office and this law actually damages the strong hospitality culture Melbourne seems to be trying to extinguish. This prohibitive law i feel is against our rights as human beings. In Queensland the venues which have prospered under the lockout system are the large one dimensional ones which don't bring any culture to Brisbane as people have to get to the biggest latest one for greater chance of,"a good night" . Melbourne has prospered with hole in the wall/laneway options for a more diverse cultural phenomenon. (which as previously stated Sydney is trying to copy, but now will have it all to them selves). I have been in this industry for 20 years and have hardly seen a fight! This is due to the places i frequent. If idiots want to punch each other in King street and other hot spots lets agree to an idiot fine ,$1000 on the spot fine for anyone engaged in a melee. Also we could put cctv everywhere as in London. Maybe there is a perception that bar owners are millionaires, this is not true, a very competetive market, high rents etc make it harder and the smaller and perhaps more interesting places will probably shut. As maybe 20%(my guess that want a later night) will head off early. This sort of rule would never come into play in other major cities of the world, as they would be too experienced/smart/worldly. All the hysterical rubbish written in the herald sun has pushed this issue to frontline news. Hopefully these same people walk around and get into more trouble in their anguished attempts to find something open and have this crazy knee jerk reaction quashed! I am very worried about the future of my business with the introduction of the 2am lockout. A bar my size (120 people), and with the hours that we operate (9pm till 6am), would be devistated by such a lockout. Bars that are licenced till 3am would also suffer as their patrons would have to leave at 1am to ensure entry, by 2am, into the late clubs. The larger venues won't mind because they will be at full capacity of 300 plus patrons. If they have to ask someone to leave, due to RSA, they won't mind not being able to replace the patron from an outside que. I on the other hand will suffer greatly, as my busiest time is from 12 midnight to 5am. I won't be able to replace patrons and therefore my crowd will get drunker and sparser. I also think that this curfew is unnecessary in Prahran and more attention or blame for crimes in this area, should be given to the fact that alot of the people who live in the commission housing would be responsible for alot of the crime. Maybe, a curfew should be placed on them. Not on the good people who come to Revellers Bar and other spots. I was led to believe, from the accord meetings, that the crime rate in our precinct had dropped. If the police are unable to keep up due to lack of numbers, maybe a security company could be hired to patrol the streets. I'm sure Stonnington can afford it. And it would look to be a positive approach, to the community, instead of the negative approach that has been undertaken. You are going to ruin the nightlife of Melbourne, which is better and safer than most large cities of the world. A small percentage of the population shouldn't spoil it for the rest. I really think it is unfair to ruin my business for those morons that can't interact in a proper manner in our society. I hope this issue is not closed and will be discussed at the next accord meeting. Because the small bars are going to suffer and we have the least amounts of trouble. As a hospitality worker my right to going out after working all Friday and Saturday night has been taken away by the Brumby Government. Heavens above for all the other 24 businesses that rely on the modern 24 hour economy to Survive. I actually agree with it & have been self regulating who we let in our door after 2am anyway. I don't need other people's problems. ie prefer to have the customers we've been monitoring ourselves throughout the night. I especially think large venues are a haven for problems. I would agree with smaller venues max 200-300 maybe having a voluntary lock out but licensed venues any bigger need compulsary lockouts. Security guards of any calibre are hard to find these days. So it doesn't matter if you have 20 guards on -probably half of them are useless. However, I think it is time Liquor Licensing recognised good operators & if like any other accreditation process looked @ what processes we are using to minimise trouble rather than coming in with the big stick and treating all venues the same. They are not working with us. Yes, we have Liquor Licensing Accords but.......... If they were serious about the goals & worked with us collectively we could achieve better outcomes. We operate on Commercial Road South Yarra in the "Greater Chapel Street Entertainment Precinct". We currently trade to 3am and have actively been participating in the (vouluntary) Stonnington Liqour Accord for 2 years. May we offer our thanks to Liquor Licensing Commission, Council and Police for their (lack of) sincerity, honesty and trust in reciprocating our a co-operative approach (for the benefit of all stakeholders) in this vibrant entertainment precinct. We were assured there would be no lockout - hey, we are a key stakeholder too!!. We have had no problems with binge drinking/ drunk and disorderly etc but the 2am lockout will change all that - now we will get blamed for distrubances and violence on the streets as disgruntled would-be punters are locked-out from everywhere (except the Casino of course!). Then we will be blamed for the increased distrurbances etc in our area! Then we will be closed down. Then the whole undustry will go underground (again). What a master plan!! Small business is supposedly the backbone of this country, but the government has just effectively wiped off our viability by curtailing our licences, without consultation, and they have handed over our critical revenue opportunities to the (big business) Casino. Perhaps we should all instal poker machines so we can get an exemption from the lockout too! Yes, let's shift the (supposed) problem from alcohol to gambling! What next - a military curfew! (or are we expected to provide more security to control the inherent problems that will come from this nonsense). Prior to my involvement with Lustre Lounge since 2002, I was hired as a Doorman by numerous nightclubs in the Melbourne CBD and Chapel Street precincts. Consequently, I have witnessed approximately 15 years of post midnight street behaviour in Melbourne. In my opinion, the level of anti-social behaviour hasn't changed whatsoever. What has changed is our level of tolerance towards it - and that's a good thing. After years of inaction, the Victorian Government has decided that enough is enough. Better late then never. It is embarrassing that one of the world's most liveable cities has been forced to impose such a severe and draconian measure to kerb anti-social behaviour. But how did we get to this point? The Victorian Government was far too slow to act. We have become familiar with TAC and anti-smoking campaigns aimed at changing our behaviour, so if the issue is big enough to warrant a 2am lockout, then surely the Victorian Government should have been running similar campaigns addressing anti-social behaviour over the last decade? If a previous effort had been made then we may not be in the mess that we are now. other illicit drug taking in the form of pills or powder. This is impossible for anybody to detect until it takes affect. I agree that something drastic now has to be done (such as a 2am lockout) after failing to address the problem earlier. Firstly I have no intention of bluntly arguing the faults in the new system. The arguments put forward opposing the new Melbourne 2am lockout (loss of culture, loss of revenue etc.) are compelling and convincing as is. Instead of reiterating these arguments (which are easily available on websites such as http://www.2amlockout.com.au), it is the responsibility of any arguments opposition to suggest better ways about executing such a policy. First and foremost, it is important to understand this is NOT AN EPIDEMIC. It is a small percentage of late night socializes who commit these acts. These people may be intoxicated but it is still a type of person who commits these acts. One obvious means to combat this issue is to increase the presence (both in officer numbers, penalties, signage, what have you) of the law. The issue of minorities undertaking violent acts is taking place on the street. Not in the venues, where the presence of bouncers and security are always felt, but on the streets. To chastise clubs and bars for maintaining a comparatively safe environment seems ridiculous. Increase the police presence. I can assure you the extra cost of police is nothing compared to the loss in revenue (eg tourism, business tax) if this law goes ahead. Another alternative solution is to identify problem areas (no I'm not talking inner Melbourne) I'm talking venue specific. Target venues which are producing this select few who break the law and impose a 2am lockout on them. I guarantee you, the "culture" of Melbourne won't suffer nearly as much if the larger clubs are chastised compared to a blanket ban on the smaller and diverse individual bars. Venues with a small capacity are not only most hurt by this new law but are also the ones who are least responsible. A clear capacity must be decided and those below ought to be exempt. I fear the pride of government will over ride sensible argument and the trial will become a permanent thing - all I have to say to Mr. Brumby is that this is the single most un-Melbournian piece of legislation I have ever heard and I very much hope you listen to the voice of reason and not brush it off as the voice of youth. This website is impartial and is not affiliated with any licensed venues. The views expressed do not necessarily reflect those of Partystar. Please do not email unsolicited commercial electronic messages to us.